what is your overall opinion of the Trust Technique Dream Day? I attended the I Have A Dream day in Vienna recently. It took place at TierQuarTier the large modern animal rescue centre which is just on the edge of the city. It was a big decision to go - to travel from Cornwall to Vienna for a one day course but my heart was telling me to do it , I felt it was the right thing to do whatever the difficulties of getting there. And my heart was right. The whole day was amazing. I have been watching the online videos for about a year so I know already about the technique and the incredible results of doing the work. But videos are one thing and actually being there is another. James and Shelley are wonderful people with big hearts and a powerful healing technique to share. I've been impressed watching James working on the videos and so meeting him was very special. He is as he seems on the films - honest, humble, calm and compassionate.... and human! I got a much greater understanding of the Trust Technique from actually being there in person and now I have returned to the video course with an even deeper committment to continue learning. It was also wonderful to meet other like-minded people from all over Europe. I recommend this day course to anyone who wants to work with their animals and to be part of this ever growing movement to improve the lives of all animals who share this beautiful planet with us. I am still carrying the warmth and joy of that day inside my heart. Thank you James, Shelley and all the people and animals who were there. Attending this 'I have a dream day with Dogs' was a dream come true for me. For a while now I have been following James and Shelley on social media and from the start I felt the importance of their method and how truely inspiring it is. 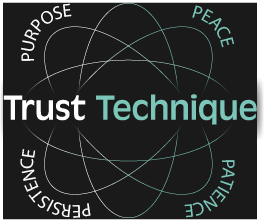 After I discovered the existence of the Trust Technique, I immediately enrolled to the online course. How many times I have been crying while witnessing the transformation of the animals who are blessed to be introduced to the Trust Technique. This day was amazing; to meet James and Shelley in person, to see them work first hand on the animals and to connect to like minded people. Again, this was my dream come true and I know that I will be more and more involved with the Trust Technique with my goal to become a certified practicioner. James and Shelley, thank you for you. I was privileged to be part of the I Have A Dream Day at Tier QuarTier Animal Rescue Centre, Vienna. Privileged to see the work that James and Shelley do with damaged dogs first hand. To watch the miracle of the Trust Technique unfold before my very eyes was breath taking and truly inspirational. They showed us a calm, serene, gentle and non intrusive way to connect and heal any animal. This has to be The way forward for all human - animal and human - human communication. I cannot thank James and Shelley enough for a wonderful day and giving me a new direction. I'm looking forward to learning more and becoming a qualified Trust Technique Practitioner. When watching James and Shelley on video, I was in complete awe. I had never seen such a peaceful, loving, trust-based relationship between human beings and animals. I had tears in my eyes with every single video I watched. And then I learned about the opportunity to meet Shelley and James in person. This seemed so unreal. And... even better than that! Because I am part of the Practitioner course, I got an exclusive invitation for a meet and greet and had the honor and pleasure to experience their work first hand. Words can‘t describe what this „I Have A Dream Day“ meant to me. It feels like I‘ve finally found my tribe - meeting not only Shelley and James, but also fellow Practitioners and Video Course Members, who all share their passion for animals. Shelley, James, you are making a difference, and not only to the animal world. Thank you so much for everything you are doing! I am so moved by the work that Shelley and James are doing, and I am so glad I attended the Trust Technique Dream Day at Apache Springs Ranch. It is very apparent to that Shelley and James are doing this as a part of a larger mission to help animals and help people help animals. Generating revenue is a necessary component of that mission, not their central focus. They are warm and genuine, and even if I only absorb a tiny fraction of what they were teaching, I will still have a better relationship with my animals, and I am confident I will be able to help both me and my rescued horse be a little more at peace with the world. Absolutely amazing experience! So happy I attended the event! It's a total game-changer in animal/human relationship and interaction. I'm deeply in love with Trust technique and all that James and Shelley do for both animals and humans. Their work is based on universal principles that are both simple and at the same time so profoundly healing, uplifting and life-changing (and I believe life-saving as well). Having a chance to see and participate in the practical part in the afternoon was such an honor and inspiration! We're all ONE and sharing peace & present moment is one of the most precious, healing and uplifting experiences we can offer each other. If there is one thing you can do for yourself - watch the videos on Trust Technique or go & take part in one of the I Have A Dream Days. Give yourself a chance to learn more about trust, peace of mind and true unconditional love, as it will be a great benefit for you no matter if you have a pet or not :-). Big love to James and Shelley. And lots of success and joy in what you do! UnfortunateIy am only now able to report back on my Trust Technique Workshop at the Wormwood Scrubs Pony Centre. One word: Fantastic! Totally in tune with what I have come to understand about horses and dogs. I recently attended the I Have a Dream Day , featuring the Trust Technique put on by James and Shelley which was hosted at the Magic Horse Garden in Pitt Meadows, BC. I was first introduced to their website a year ago, during a large transition period in my life. I had recently lost my job of 11 years due to budget cuts. I had decided to spend the summer healing, resting, playing and staying out of my own way to see what would show up for me. James was one of the beautiful gifts that showed up. Watching the free videos I was filled with amazement and wonder and I was blown away with what I was learning. But most importantly watching these videos, I was healing. So when I saw James and Shelley were coming to BC, there was no hesitation in registering for this workshop. I am so grateful for having met them and the day was filled with such compassion, sincerity, gentleness, humor, true listening, cooperation and trust. The level of gentleness felt from James was SO profound, it touched my heart deeply. They gave us tools and techniques to help us have mindful regard and trusted cooperation with our cherished pets, which ultimately will bring a peacefulness into our relationship like no other. I am so very grateful to both of them for their teachings and for coming to BC, close enough for me to attend. They will be back next year, and I will be there! Wish they lived closer as they are dear people I would love to be good friends with. Most sincere love and gratitude! I had the opportunity to attend the in person teaching of I have a Dream Day with James and Shelley. Our group was so fortunate to have been hosted at the Magic Horse Garden in Pitt Meadows BC, with our gracious hostess Carolyn. In May of 2017 I signed up for the Lifetime Video Course and later for the ACT 1 CD set. These videos and CD’s are a tremendous learning tool. I can watch them time and again and pick up more information each time. They have helped me connect more and more with my dogs and have become a benefit to myself in my everyday life. If you do get a chance to attend I have a Dream Day workshop please take that opportunity you will not be disappointed. Both James and Shelley work so hard not only for the animals but also for the attendees of the workshops. During the workshop breaks James was only too happy to answer any questions someone may have had in regard to their own personal pets. It was a long day filled with learning and practice of the Trust Technique; I feel so fortunate to have been a part of this whole experience and would attend again and again. James and Shelly also offer a Practitioner Course, which was mentioned at the end of the day for anyone that would be interested going further into the Trust Technique (i.e., having your own business helping animals after you have graduated from the course). Not once was there any pressure to go that route, as they understand not everyone is meant to be a Practitioner. I closing I would like to say Thank you to James, Shelley and our hostess Carolyn. The "I Have a Dream" workshop in Pitt Meadows Magic Horse Garden was just the most wonderful day ever. I enjoyed every minute of it and feel so lucky that James and Shelley came all the way to B.C. to share their expertise and peace. Theirs is a gift to heal the earth, animal and person together, two by two! Their compassion for "relationship of regard & integrity" with animals deeply felt and clearly demonstrated. The workshop is presented professionally, well paced, full of experience and sparked with humour. I would attend all over again tomorrow in a heartbeat just to spend a day immersed in peace again and to support their amazing life work. Please come again! Thank you. If you truly, truly wish to learn and understand authentic animal communication (not the TV kind where the celebrity is the focus and the animal is the prop) go to the link. James French and his wife Shelley taught in person yesterday their technique. What an honor to see the animals respond. He knows their subtle language. He goes to them, not forcing them to come to him. Amazing group of dedicated animal healers, shelter people, rescuers, foster care folk, pet owners. Anyone can learn this. It works for all animals. Watch the videos. So inspiring to watch a real healer with animals. No animal was pushed against their free will in any way. Free will and co- operation transpired because he listened to the animal's subtle expression of need. Beyond telepathy, true spiritual engagement. He will be back again next year. My daughter and I spent the MOST amazing day at the I Have A Dream workshop in Pitt Meadows, BC. I grew up with horses in the UK, but learnt more about these beautiful animals in one day spent with James and Shelley. This learning will be invaluable for my daughter, who is 12 years old, in breaking the old paradigms which are taught when learning to ride. It is the divine right of all animals to be treated with mindful regard, and the deeper understanding that we delved into in this workshop will be a lifelong practise. This is a technique that we should be teaching in schools. It will benefit everyone. My rescue retired racing greyhound and little whippet are also extremely grateful. Thank you. Thank you. April 22, 2018. In the heart of London we find Scrubs Pony Centre created by Mary Joy. dedicated to assiting humans and horses find a balanced relationship. Thank you to her and fellow students sharing this experience with us. Please watch the video, "What Happens On A Trust Technique Dream Day? " taped and edited by J & S. . . a beautiful memory of this special day. James & Shelley, Thank you! The dream day passed by too quick......returning home with true inspiration and motivation. Debbie`s review below said it perfectly!! Well structured and delivered with warmth, passion and humour by James and Shelley, who have a great connection and clear love of animals. I met some interesting people and look forward to learning more about the trust technique. Special thanks to Mary Joy, staff and volunteers - they do wonderful work. And of course, thanks to the horses for their trust and cooperation. Absolutely wonderful to be in the generous and loving energy of James and Shelley . Having completed the Video course, I was very inspired by hearing the basics in a seamless format, including lots of new perspectives, and learnings. Observing the sessions with horses was invaluable for noticing many subtleties and nuances - in the animals’ behaviour and in James's approaches and responses. I cherish this opportunity and would certainly attend another I Have A Dream Day just to be in this beautiful energy amongst such dedicated people. Thank you. Thank You James and Shelley for this amazing day full of inspiration and insights! I am so grateful that you share your experience, this art of creating a peaceful connection with animals, in such a way that we all feel that we can learn the tools to create peace on earth!!! I have learned so much about the Trust Technique, about myself and how other people and animals behave. It was a great day. To see the use of Mindful Regard was really beautiful. Thank you. Wow what an amazing day, truly inspiring, I hope to go further with this once I've completed the video course, I am truly grateful for having had this opportunity to meet you both and experience the "I have a dream day". Thank you so much for a wonderful day! Even though the video course is very comprenhensive it adds another dimension to understanding the technique to listen to, and see James working with it in person. There is so much love in everything the two of you do, humility and respect for all living things, it really warms my heart. Im really happy I took the course and glad to be a life time member. Thank you so much for a wonderful and inspiring day. The place and the weather were beautiful. So much to learn with the help of our 4 legged friends. Hope for a better future when humans and animals live in harmony and love. What an amazing day! I have been studying the online course for a few weeks now but attending a one-day course was invaluable in developing my understanding of the Trust Technique. I had many discoveries both of myself and my horse who has been through so much in her life ( all three of the most difficult life experiences that James mentioned). Watching James work with Mumba was so valuable as I realised that what I thought was my inability to carry out the technique as a novice was, actually, my horse processing! It might take a while for her to let everything in her past go but it is going to be so worthwhile to bring that peace to her. Thank you so much James and Shelley for continuing to develop this amazing relationship tool - I am so glad I signed up to the online course for life so that I can follow your progress. Thank you both so much for a truly inspiring day James and Shelley. A wonderful,heartfelt training day. Relaxed and entertaining as well as sensitively delivered by James and Shelley. I'll treasure this new knowledge. Thank you. A brilliant day, it was lifechanging for me. Thank you so much, you have restored hope in me for the human race. It has shown me that I am on the right path to helping heal animals and humans through enhancing relationships. Thanks again, I hope to see James and Shelley again soon. Thank you so much for such a wonderful course on Saturday. I was so moved by what I saw. It has certainly always been my hope that one day animal cruelty will end and that increasingly man will live in harmony with animals showing them love, tenderness, respect, compassion and that wonderful friendships will blossom. I always saw it as a dream, too big to be realised, but after the weekend what really touched me is the realisation that wonderful people like James and Shelley are taking this forward as TRUE Lightworkers. They are working so hard, growing and developing, spreading the word, educating and training many people in a different and beautiful way to "BE" with animals. Its difficult to put into words when you experience such a deep connection of caring, authentic pure love and I feel so privileged to have witnessed that on Saturday and to have felt that in my own heart, what an amazing gift it was !!!. My heartfelt thanks to James, Shelley, their son, the wonderful horses and all the lovely people I met on the day, The memory will always remain in my heart. The dream day was my first experience with the trust Technique. I can only recommend it, it was a fun day, we learned a lot, and got to watch James demonstrate how to truly connect with horses. This technique, or way of communicating is a loving, respectful and sensible way to connect and communicate. Being in the moment doesn't just benefit the animals, it will benefit every relationship, whether with humans or with animals. I am definitely going to explore more and learn more through the video's. Big thank you to Shelley and James for your dedication and love! Having now done 4 different courses with James and Shelley, the delivery of the information is still as fresh and interesting as ever. Their passion and desire to help animals is so authentic and from the heart. I learnt loads more on this course and would definitely recommend it to anyone who wants to improve their relationship with animals. The trust technique is so simple, loving and peaceful and that's its power! Love it. Thank you James and Shelley for the incredible week at the Omega Institute. It was such an honor to see James at work with all the incredible animals we got to meet. The skills and tips I learned during the week have made a world of difference in creating a bond with my new rescue dog of 2 months. That is not to mention how much the technique has changed my own life. This straight forward and gentle approach can change the world! Thank you again! Shelley and James are genuine, warm, caring individuals. The Trust Technique provides everyone with the ability to truly care for and protect our fellow animal beings and friends. Delivered in a simple, yet, touching and soul searching way, this technique is amazing and I am thankful for such truthful and caring people as Shelley and James are for their dedication in sharing this for the good of all beings. I will be continuing my journey and look forward to it with excitement and positivity. I recommend this, don't keep thinking about it, attend an I Have a Dream Day, it's wonderful. I am truly grateful to James and Shelly for making possible the 5 day trust technique at the omega institute in NY. Having done at least 8 other animal communication courses all in Europe I din't know what to expect: it was really amazing and exactly what I needed to learn to progress on a spiritual path with animals. Generous in their teaching, walking the walk, doing the talk, a friend asked me if what I saw on the video course was real, yes, it is really real! I am truly grateful and feel so lucky to have witnessed the amazing connection, literally beyond words, possible between James, Shelly and animals, who never lie about energy and feelings. I have learnt so much from just being present, I came from Italy but feel like I went to the moon.thank you thank you thank you. I attended the Dream Day in California in July with James and Shelley. It was an amazing experience to feel the work in person. 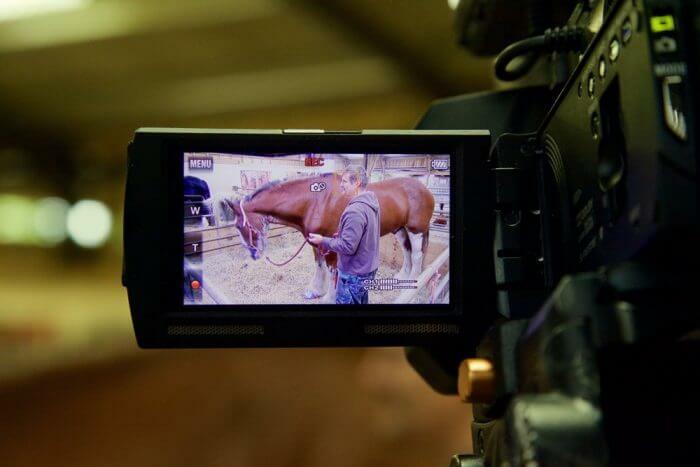 I really loved being able to watch James work with the horses, and just how they reacted to him. It was as if they just wanted to be near him, they could feel the energy -- it was familiar and delicious to them, and it was wonderful to watch them scoop it up. As wonderful as seeing the videos are, seeing it with your own eyes is an experience you don't want to miss. I attended a workshop with James and Shelley in Australia earlier this year. At the time I was about to give up on a rescue horse that had come into my care. I had been advised by vets and horse experts that this horse was beyond help. I was having trouble letting go of her and attended James Trust Technique Clinic as a last hope. Through the learning of the technique and the very positive conversation held with James in regard to this horse, everything has turned around. James encouraged me to keep going with her, and through the use of the trust technique she is now a completely different horse. She has gone from what most would say dangerous, to soft and lovable, and has even started a career helping troubled teenage girls. I would highly recommend to every animal owner to attend a workshop and to purchase the video course. Its content is invaluable. Thanks James for hearing my story tears and all, and for your encouragement to keep going, your advice was so helpful. James and Shelley are spearheading a new movement in communicating with animals. The workshop contains information that is so important that it is not only riveting it feels that it is opening a portal in your heart and mind. I loved it so much I didn't want to stop for morning tea or lunch. This has never happened to me before. Amazing is what it is.!!! James and Shelley are godsends. This work is so important, so accessible and so loving.In February, James and Shelley delivered a well thought through, well timed and easy to follow expose of the Trust Technique in a day workshop. i would re-attend in a heartbeat. Both James and Shelley compliment each other - their belief in their work is evident and this, in turn, impacts information delivery in a very positive 'I can do this too' fashion. i'm very very keen to follow on from the video platinum course into a practitioner course as i feel like i've been waiting my whole life to work with animals in this way. i came away from the February workshop wanting more, very pleased to have been included and open to much broader learning. As a vipassana meditator for 22 years, daily trust technique practice is a natural compliment. Thank you for globalising this natural, fundamental way of being.